For the last year or so I have been listening to others talk about ESGI (Educations Software for Guiding Instruction) and how it has changed their way of assessing students. Of course I didn't really buy into their stories because I couldn't imagine any tool making assessment quick, easy, or something I looked forward to doing. A few weeks ago it came time to start a new school year and I was once again faced with the daunting task of assessing all of my students on their letters, sounds, numbers, and other phonics and phonemic awareness skills, while also teaching routines, classroom rules, letters and sounds. Of course I also wanted to quickly find out what letters and sounds my students knew so that I could focus my instruction on their needs rather than randomly teaching all of the letter and sounds. With all of this in mind I decided that the start of this year was the perfect time to look into ESGI for myself and within a matter of minutes I had fallen completely in love with the software... and I mean COMPLETELY in LOVE with it! For the first time in my teaching career I can say I am truly excited about assessing my students. 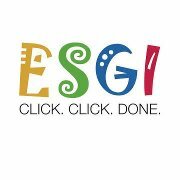 ESGI has turned what has always been a painfully tedious task into something that is quick to administer, easy to manage, and more beneficial than any assessment I have given on my own. For those of you who have steered away from the software because of the words interactive, online, or web-based, rest easy because the software is so easy that even a novice can figure it out with a couple of minutes. Without any technical instruction or assistance I quickly figured out and entered my entire class within only a couple of minutes. I began assessing my students immediately even using the down time while we were in line for whole group bathroom breaks. I had my entire class fully assessed within about a day and a half and I didn't even have to stop my teaching, skip any of my lessons for the day, or give my students busy work in order to call them over and test them. Assessing is as easy as a simple question such as "What sound does this letter make?" and a quick click on "Y" for yes or "N" for no depending on if the student answers correctly or not. As if that is not great enough the software also provides you with easy to read individual and whole-class data, individualized flashcards for each student, and parent progress letters. With a few clicks on my keyboard I was able to see what letters and sounds I needed to target during my instruction, create parent letters breaking down my assessment results, and print out individualized flashcards to send home with each student. In case you are worried that the software will not meet your assessment needs it comes with the capability to create your own assessments when needed. The software comes with a built-in sight word assessment, but I liked having the option of creating one based on my district's word wall list. On top of all of this, my students loved being called over and assessed on my iPad. They all kept asking if they could go next. When I was done assessing my students there was no paper work to sort through or file and with a few clicks I could easily read the data on my students and see where to begin teaching or how to group them for small group instruction. With the ease and speed that comes with the software I look forward to assessing my students more often so that I can make sure my instruction stays targeted and focused. In addition, the software can be accessed anywhere you go and on any type of device so you can look at reports from home and assess on your computer or any other type of tablet. Yep, I love it too! I've used it for a few years now, and making our own customized tests are just great. Signing up for a trial...I'm convinced! Thanks for highlighting this product. It is a boon for the parents to track the activities of their children's. really nice information and tips discussed. thanks for sharing it. It is evident that students have started using computers hence for practice purpose schools give assignments that has to completed on a particular software. Is anyone aware of any research that has been done using this programming? This is a wonderful post. Using ESGI in a classroom sounds like it would enable teachers and students to do different things to help inform their teaching practice. As Thornburg stated, “Modern tools, many found in the homes of our students, allow us to explore rich domains of study to levels of depth unimaginable a decade ago” (2004). There is a difference between doing different things and doing things differently. I feel it is very important to recognize this when thinking forward to 21st century assessments using software on an ipad or computer. One way ESGI allows teachers to do different things instead of doing things differently is that is allows teachers to collect data effortlessly. I will have to look into this program! In response to Dawn Bright, what kind of customized tests have you created with this software? How did you hear about this program? I had never heard of it before until reading this blog post. Through ESGI's Facebook page, I saw that there is an option to create "Bar Graph Analysis" reports. I feel this woud be very helpful to see which students and how many students answered certain questions correctly on each test through an item analysis. I'd be curious to know what findings you have found Dawn through the bar graph analysis from the tests you have created. Still there is a need as to establishing the true facts liable to be done in this regard and further we will bring around some of the more true values. I had never heard about EGSI before and like you would feel a little sceptical using it. After hearing about your successes I feel as though it could be a great resource to help assess the littles and will save time on the data collection. Thank you for the post!